Demand for the services of soundtrack artist Cliff Martinez should be quite high. The current "go-to" guy for exotic and electronic sequencer scores, this former drummer seems to have an advantage over rhythm makers of the digital realm. His imaginative compositions feature echoing arpeggio patterns, synthesized symphonics, glass harmonica textures, steel drum runs and mallet instrument patter - and are avidly being imitated by B-list strivers hoping to produce the energy, feel and ambiance that are present in works by Martinez. Often associated with directors Steven Soderberg and Nicolas Winding Refn, Martinez has been given the freedom to realize music that not only augments the narrative, but also explores intriguing regions of atmosphere and motivity. 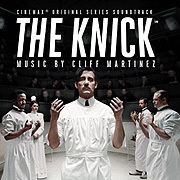 His music for the cable TV series The Knick (51'08") includes a few signature motifs from earlier arrangements [such as Solaris (2002) and Drive (2011)], yet manages to generate new and novel sonic scenarios to enhance the storyline. The album's 20 short tracks are each individually imagined, composed, directed and connected to specific parts of an episode. Ordered notes interlock and groove against slow marimba melodies, which enlivens the illusion of depth projected on a flat surface. Soft metal tones touch, in the air and in the heart. Howling drones scrape past our ears, as reality is remade. Martinez claims that his music is simplistic, and feels that it does not work all that well outside the project it was produced for. We can agree that it is often minimal, but that is its virtue. In a field where an unlimited number of sounds and layers may be used in the creation of music, finding work that states so much, in such a brief span, using so few elements, is quite refreshing. This kind of innovative music is often a hard sell to the general public, who feel befuddled or intimidated by its complexity. Martinez is helping to bring it before their imaginations. The Knick is energetic, brainy, original and (best of all) enjoyable - and it even delivers the weight or subtext required in a scene, or an entire story. This is a standout creation, for the moving image, and the moving mind.